Yesterday, as we already told you, Apple introduced smart battery cases for the iPhone XS, iPhone XS Max and the iPhone XR. Priced at $129, the cases can be ordered from Apple's online store and they will ship starting this Friday, January 18th. But suppose you want such a case for the Apple iPhone X? Can you use the case designed for the iPhone XS? After all, both phones are nearly identical in size. 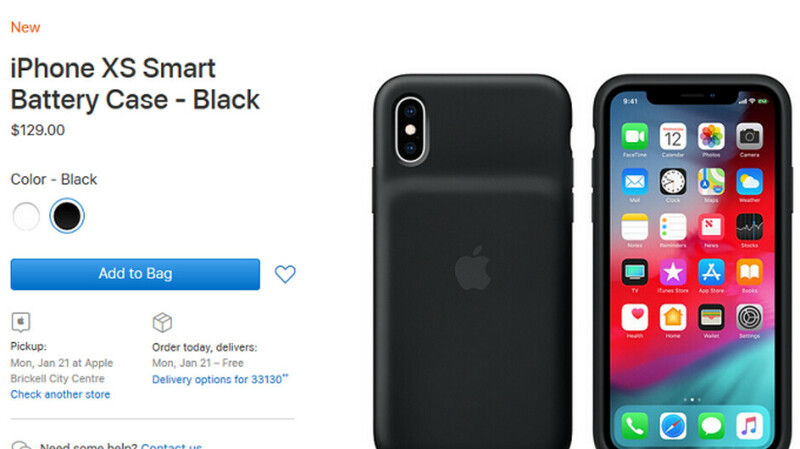 According to Apple's support page, "The Smart Battery Case isn't compatible with iPhone 8 or iPhone X." But that isn't the end of the story. As noted by iMore, the iPhone XS Smart Battery Case will work with the iPhone X once you dismiss the pop-up message that says "this accessory is not supported by this device." If it doesn't work after the pop-up leaves the screen, rebooting the phone should do the job. Keep in mind that the cameras, mics, speakers and charging port on the 2017 unit might not align perfectly with the case. If you do indeed own the Apple iPhone X and are in the market for a battery case, you might want to consider Mophie's Juice Pack Air. Available in Navy and Black, the case will extend the battery life of the phone by 30 hours and is priced at $99.95. Considering the cost of this, I would rather follow directions and not use it for the X. How about a bigger battery?